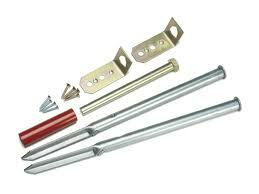 Anchoring bolt down bench fixing kit suitable for soft surfaces. Anchor driven below ground with tamper proof screws. Help to protect your furniture from vandals and thieves. Each kit contains 2 No expanding bolts, 2No brackets and 8No screws.